We are proud of the work that we do and the people that we hire. We want to show off our team to prove that we are the best in the business. Each image above has a unique story accompanied by many conversations and detailed planning with our clients. We provide ample lead-time to ensure the services we provide are the right solution for you and your property. Our team is trained to think strategically and methodically, leading to a successful execution of each specific job. At Atlanta Arbor, we pride ourselves on our honesty, integrity, and work ethic. Our goals are to empower our clients to hold us accountable for the work we do. We strive to be transparent while maintaining the highest level of integrity for our business. Most importantly we want our clients to be happy with the services we perform. 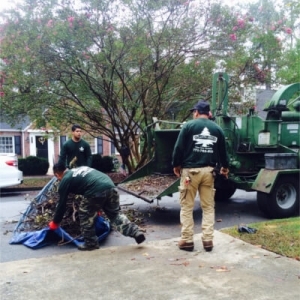 Atlanta Arbor is here to ensure that your property is preserved without breaking the bank. Take a look at some of our on-site pictures to see how we work as a company to gain a little more insight and peace-of-mind in knowing that we are the right people for the job. Want to be a part of our story? Send an email to us at info@atlantaarbor.com complete with images and we will add you to our growing portfolio. Still not sure if Atlanta Arbor is the right business for your needs? Check out our glowing reviews on Yelp to learn why we are the best.